April 12, 2019 -- We already know that the Fed has been sending market-soothing messages about monetary policy, a regular drumbeat that has been beating now since a December gaffe in communication about short-term interest rates set investors on their collective ear. Certainly, there was nothing in the minutes of the March meeting to suggest otherwise, but all the same, not every Fed member is on board with a stance of keeping interest rates at present levels for a period long into the future, let alone cut them anytime soon. After a programmatic period where interest rates were routinely raised and the Fed's balance sheet trimmed by predetermined amounts, things have changed. The Fed has for a while stated that they "data dependent", that is, that they are waiting to see how things unfold economically before deciding what to do with rates. The Fed's balance sheet will soon see a tapering, then ending, of runoff, with future manipulations of holding determined by needs for reserves and other considerations. As evidenced by the Summary of Economic Projections (SEP, including the so-called "dot plots of expectations of future growth, inflation and policy rates) the majority of Fed members do expect to see things on hold for a while. Others, however, see things a bit differently, and don't think that a hike in rates is completely off the table for 2019, let alone beyond. So "several" could change their minds, and "some" expect to be voting for higher rates later this year. Markets aren't convinced that there's any danger at all of higher rates; futures markets think there is even a 10% chance of a rate cut as soon as June, a probability which grows the deeper you get into 2019. Mortgage rates lower than expected in the early part of this year are supporting home sales anew. 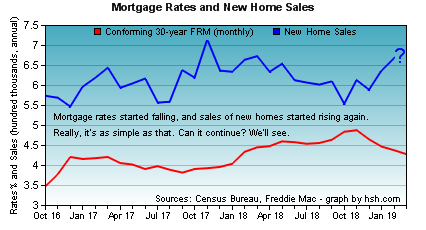 Unlike existing homes, whose sales are tallied when the title changes hands, sales of new homes are recorded when contracts are signed, and the decline in rates has led to a decided upturn in sales of new homes. With inventories of existing homes still very tight, there may be more opportunity for sales of new homes to grow more strongly this spring than there is for existing homes, where a spike in sales for February lifted them only back up to fairly modest levels. While the economy did start 2019 on a soft note, that seems to be fading behind us into the rearview mirror. It'll be a couple of weeks yet, but the initial reading on first quarter GDP might not be 1.5%; that said, data becoming available late in the period was considerably brighter than earlier. By way of reference, the Federal Reserve Bank of Atlanta's GDPNow estimator stood at less than 1% just three weeks ago; now, the estimate of growth has been improved all the way up to 2.3% as of April 8. Improving growth isn't enough to warrant a hike in rates any time soon, nor is a tightening labor market; the Fed has noted as much. No, we'll need to also see rising and possibly sustained price pressures for that stance to change, and while we don't see that yet, there's a lot of year ahead. Certainly, the latest available news on inflation wasn't anything to be concerned about even if there is some nascent firming in costs to be seen. For example, the Producer Price Index for March rose by a rather firm 0.6%, the largest kick in prices since last October. Rising energy costs and other inputs pushed the headline figure up; leaving those out, the "core" PPI rose a more mild 0.2% for the month. The trends between overall PPI inflation and core have diverged somewhat, as headline PPI is running at a 2.2% annual clip, a bit warmer than seen in recent months, while core PPI's 12-month rate is 2.1% and still cooling after a warm stretch. Downstream of production, consumer prices told a similar tale. Headline CPI rose by 0.4%, the largest one-month bump since January 2018. Food and especially energy costs were the culprit, and leaving them out, the core CPI managed only a 0.1% rise. As with PPI, the annual rate of overall CPI firmed to 1.9%, while core is still cooling a bit, easing to a flat 2%. The Fed's preferred measure, Core Personal Consumption Expenditures (PCE) has been running a little lower than core CPI, and as it is influenced by the same items as the core CPI, it may settle a little more as well. As we are a nation of net importation, prices of goods coming onto these shores can certainly affect inflation trends to a degree. The latest report covering import prices for March found a 0.6% increase in costs, rather more than analysts expected and a third consecutive increase. That said, the recent uptrend for prices here has only been strong enough to erase a declining trend, and the annual rate is running at 0 for the moment after three months of declining prices. Costs for exports are also increasing a bit; the 0.7% increase for March matched February's increase, but even then, the annual rate has firmed up to all of 0.6% for the last 12 months. So price pressures of concern are not yet evident, but if the economy is growing more strongly and labor markets remain tight, any sustained increase here will absolutely put the Fed "in play" at some point, and "several" and "some" above will likely become "more" pretty quickly. One item of market instability has been kicked further down the road. Brexit, which was supposed to have a hard deadline of March 29 (postponed until today) was not resolved this week, but has now been given a deadline of October 31, leaving Prime Minister May and the Parliament more time to come to some kind of agreement as to how the divorce should happen. Six more months of market muddiness isn't the worst possible outcome, but having no resolution will likely keep growth in the U.K. and the greater eurozone more damped than it would be if the direction -- hard exit or soft -- was better known and understood. As such, the economic drag will likely continue into the summer. The labor market here in the U.S. may be tightening a bit more. The last few months has seen job growth rather erratic, with big gains, almost no gains and middling gains all on display in just the first 3 months of the year. Compared to January, there were somewhat fewer job openings in February, with the 7.087 million figure from the Bureau of Labor Statistics down a bit from recent months but still highly favorable, and claims for initial unemployment benefits dropped to the lowest level of the expansion to date in the week ending April 6. At just 196,000 new applications filed across the us, it's the lowest number since October 1969. It may be that the pace of hiring is settling back some after a strong end to 2018, but it's equally true that very few people are losing their jobs, so the economic expansion continues apace. Consumer moods faded modestly in the initial reading of Consumer Sentiment from the University of Michigan. A 1.5-point decline in the barometer produced an early-April value of 96.9, a bit of settling after a 4.6 point jump for March. Assessments of current conditions were improved, with this subindicator rising 0.9 to 114.2, while the outlook for the future dimmed a little, with a 3 point drop leaving this component at 85.8, roughly in the middle of the four values available for this year. Overall, a middling report with no real implications for consumer spending. The general trend for interest rates and mortgage rates over the last couple of weeks is one of weak firmness, if such a thing could be said. The severe, impending-recession doomspeak that raced though the markets a few weeks ago seems to have passed, as have expectations for any kind of near-term rate cut by the Fed. It seems to us instead that there is a bit of growing acceptance that the U.S. economy is faring OK in the face of offshore headwinds, and that while Fed policy rates could be lower, they really aren't all that high at the moment. For its part, the Fed has embarked on a "move along, nothing to see here" sort of messaging, and given the improvement in financial market conditions over the last couple of months now, will be in no immediate hurry to say anything else. As has often been the case, the markets will let the Fed know when they are ready for higher rates to come. Whether that's later this year, next year or perhaps not at all, one thing is certain: It's not happening next week. A fair bit of important data (including retail sales, certain housing indicators and the Fed's own Beige Book) is due, and we think that with a mildly improving tenor to the data overall that rates will hold steady or perhaps rise a couple of basis points. Figure on a 1-3 basis point increase in the average offered rate for a conforming 30-year FRM when Freddie Mac reports next week.